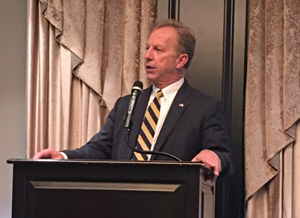 Kevin Hern speaking Friday to Tulsa Republicans. Analysis: At a Republican meeting Friday, many candidates on the runoff ballot next Tuesday spoke as voters prepare to decide. Republicans attending represented networks of friends, family and associates who will vote in this critical election. Everyone is talking as positions on races solidify. The event began with Congressional Candidate Kevin Hern. His opponent didn’t show and the crowd, with one exception, didn’t complain. Hern is the most “Trump like” candidate for Congress in Oklahoma history. That is saying something for a populist state just over 100 years old. Finally we have a chance to elect someone that represents the people – as opposed to the lobbyist big-money controlled tools we usually get; trail lawyers, billionaire ranchers, etc..
Hern is a businessman that first rallied the crowd with warnings on escalating national debt then with encouragement of free markets and established business principles proven successful for thousands of years. Hern spoke against Republicans who are blocking President Trump’s principle driven agenda. 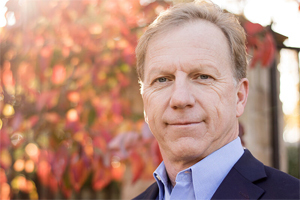 It is the difference between Kevin Hern and his opponent – an attorney that equivocates against President Trump. Hern, like Trump, is a political outsider from private business who inspires confidence in the future based on proven economics. The business of America is business not entitlements. Hern asserts he will support growing individual prosperity for all of our people. Next up were the two candidates for District Attorney, but from the content of their individual presentations, only one spoke as a Republican. Attorney Ben Fu discussed systematic problems with established law, not the operation of the District Attorney’s office. In his battle against his former boss; Fu defines himself in the latest trendy progressive experimental alternatives to justice. His topics would have been appropriate if he runs for governor or the Legislature. Fu failed miserably to discuss in detail the office for which he filed and in which he once worked. Apparently, within existing Oklahoma Law, Fu doesn’t disagree with how the office generally operates day-to-day. 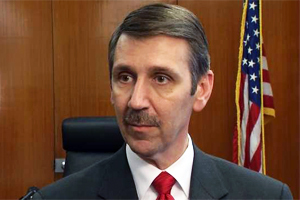 Current Tulsa County District Attorney Steve Kunzweiler is one of the most dedicated of public servants and declares unvarnished loyalty to the citizens of Tulsa County. From his first day in office, it is clear he fights for justice for each and every victim of crime. Kunzweiler spoke of the volume of crime locally, the specific operation of the office and the unique challenge of fighting crime in Tulsa County saying he has the “persistence to do what is right.” He also noted “for the past ten years, Tulsa County has led the entire state in the number of people placed in alternative court programs.” He spoke of creating specialty units for specific types of crime similar to those in much larger cities. Kunzweiler’s tenure to date has been a study in continual crisis. 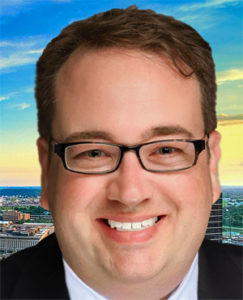 While some may disagree with individual decisions, even his critics praise Kunzweiler’s dedication to fight for victim justice. Republican candidates for County Commissioner reside beyond the City of Tulsa. 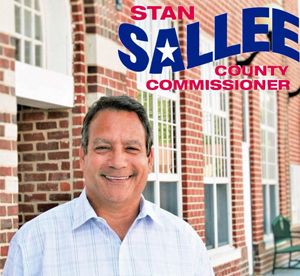 Stan Sallee from Collinsville and Tracey Wilson from Sperry would likely both bring a refreshingly new perspective to the County Commission. However, District 1 extends south to 71st Street along the eastern part of the County which includes significant parts of Broken Arrow. The winning candidate will be the one that connects best throughout the District – north and south. Stan Sallee spoke of his family’s Oklahoma heritage, attending the University of Oklahoma and his time as a Collinsville City Counselor and Mayor. He pledged to be assessable and accountable to the people of District 1. Sallee spoke of working with the County Sheriff, other law enforcement and all county municipalities. He mentioned the Countywide infrastructure program Vision 2025 and the role he played to help implement improvements. Tracey Wilson is less known in Republican Party circles. He is a businessman with an MBA long active in; oil and gas accounting, fleet service maintenance, materials management and information services. In presentation, Wilson first declared himself a conservative outsider focused on specific needs in the unincorporated areas. Those include overgrown grass which is frequently a hazard at intersections blocking visibility and dumping along county roads which is illegal but frequent. Wilson impresses the listener not for political savvy or witty banter, but in his commitment to foundational service – a roads and bridges kind of guy. 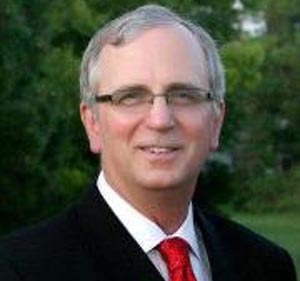 Chief Deputy Assessor John A. Wright is running for the top job and it is clear he is the only candidate qualified – even his opponent, on that, agrees. Wright first spoke of his predecessor and loyalty to the office. That loyalty is demonstrated in the massive effort Wright made to earn an Assessment Administration Specialist (AAS) professional designation from the International Association of Assessing Officers (IAAO). It required exhaustive effort with testing, case studies and ethics training at the highest levels. Wright, a former state legislator from Broken Arrow (1998 to 2010), also declared he was not in the state retirement program and is not looking for a job (a dig at his opponent). He said the office of 83 people has not grown and that they hold themselves to a zero based budget. Again, Wright demonstrates and promotes conservative principles. “The office examines 31,000 deeds, 15,000 to 17,000 sales and inspects visually one fourth of the properties in the county each year,” noted Wright. The monies raised fund students, teachers and public services throughout Tulsa County. Darren Gantz ran unsuccessfully for Creek County Assessor then moved to Tulsa County where he ran against a popular GOP legislative incumbent and lost. Gantz claims to be a “successful” businessman selling insurance. He had an insurance franchise in Creek County that failed and a retail business in Tulsa (Rent Ready 4 LLC) which also failed and seems to be the primary cause of a bankruptcy case #11-10110-R showing $482,365.00 in liabilities. In that bankruptcy, Gantz lists unpaid sales taxes of $650.00 to the Oklahoma Tax Commission. In the meeting Friday, Gantz said, “this office is not just about a lot of credentials or being in real estate because the statutes say two things; 18 years of age and registered in your party in your district six months prior to filing.” Gantz did accomplish that much in preparation for the office. Tulsa Today encourages readers to explore each candidate’s web site, Facebook presentation and carefully consider each vote next Tuesday, August 28. This entry was posted in Local on August 21, 2018 by admin.